Everyone has an event in their life that changed everything, even if they didn't know it at the time. Rick Harris came in the spring of 1969 when his dad wouldn't co-sign for a new Z-28 Camaro. He bought a Volkswagen Beetle instead! Being 21-years-old, he wanted a Z-28, not a Beetle. After driving home from the VW dealership, Rick pinstriped his new car. Later, he took the Beetle back to salesman at the dealership to show him his striping job. Everyone at the dealership was impressed with his work, and Rick was soon striping a Beetle for them. This first striping job was a blessing in disguise. Even though he didnt know it at the time, Rick's dad did him a great favor  not co-signing a loan for that hot Z-28. This led to a lifelong career in pinstriping. By 1973 Harris was confident enough to stripe street rods at the Street Rod Nationals in Tulsa, Oklahoma where he met Chuck "Shaky Jake" Babbitt  a very accomplished striper from southern California. 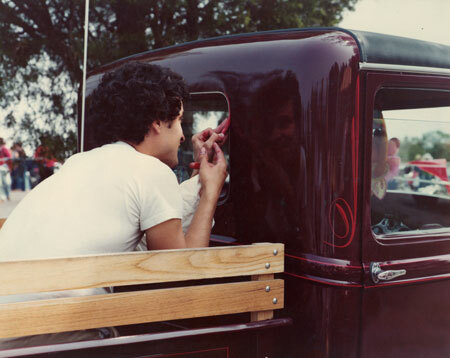 Rick says, I owe a lot to Shaky, because he taught me a lot about striping, and how to make money in the striping business. By 1980 Rick became a full time pinstriped and made many trips to Costa Mesa to work with Shaky Jake who passed away in October, 1987, and a lot of stripers were inspired by his work and also his willingness to show you how it was done. Rick also has the willingness to show others by teaching several classes a year on the art of pinstriping. 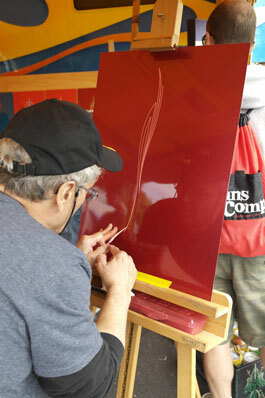 Harris has been pinstriping and painting for over 40 years, and he still learning new tricks all the time. His career is not over, being one of the most sought-after pinstripers. Rick Harris, panel striping at the PPG trailer at the 2014 Goodguys Nashville Nationals in Nashville. The event was a Celebrity Panel Jam where Rick, Brad Foy and Josh Lemon striped 18 panels with the proceeds of the sales going to St. Jude Children's Research Hospital in Memphis.